Today we explored how to frame our performance. This will make it obvious that we will be performing a piece of site-specific performance art and not just an activity that could be ignored. It was evident to us that this was something we needed to do as each time that we played around with ideas within the toilets we have been looked at in disgust or curiosity. It isn’t yet recognizable as a performance. The first idea we had was to write on the mirror. 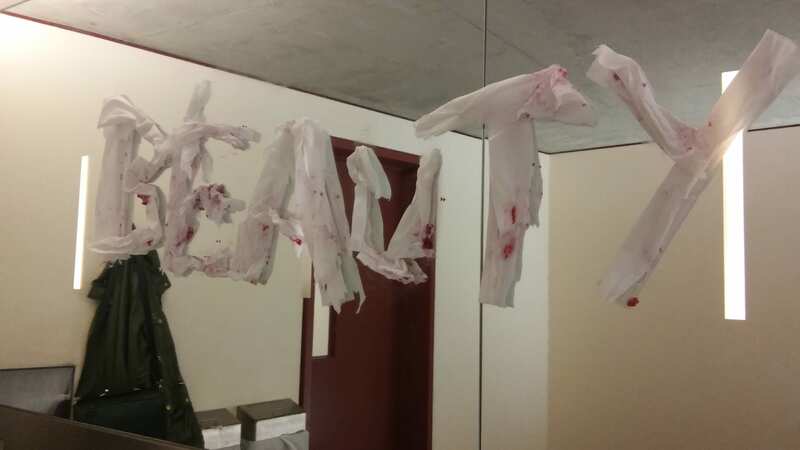 This was explored through the use of toilet roll, we used it to write the word ‘Beauty’ and stuck it to the mirror with the berries. This was to make it clear what our performance will be about and by using the toilet paper we are keeping the performance relevant to the site by using authenticity. We will be putting pictures on the wall behind us of women in magazines that we are supposed to aspire to as well as pictures of female nudes that the Usher Gallery exhibit. These both feature within our performance text so we believe it will make sense to have a recording this played aloud for the duration of our piece. This is because we are not able to have a set audience for our performance, they will come and go as they please. Throughout our performance we will also write on the mirror in red lipstick words with phrases that we believe are appropriate. When playing around with these ideas we gathered a lot of responses from women who visited the toilet. The majority spoke to us, asked questions and seemed genuinely interested. It sparked debate and discussion. It was exciting to finally see our performance coming together by receiving the responses we wanted.